We had a beautiful Mass on May 12, 2018 celebrating our three Jubilarians for 2018. 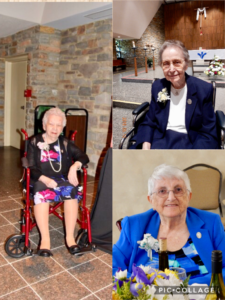 Sr. Rita Thomas, who was born in Baltimore and joined the Sisters of Bon Secours in 1943, celebrated 75 years as a Sister. During her career, she held many staff and supervisory positions in both acute and long-term care at Bon Secours facilities. She was Provincial Head of the Sisters from 1973-1979. “I always had the challenge of balancing charity care with fiscal responsibility, but never lost sight of the mission os the Sisters of Bon Secours,” says Sr. Rita. East Baltimore native Sr. Mary Cabrini Bonnett graduated from the Bon Secours School of Nursing in 1953, five years after joining the Sisters in 1948. She celebrated her 70th Jubilee. In Wildwood, N.J., where she was the superior and administrator at the Angelus Convalescent Home, she was named honorary fire and police chief and elected Woman of the Year for her outreach efforts in the community. And Sr. Jean Aulenback, who emigrated to the United States from Canada, met the Sisters of Bon Secours in 1952, joining the Congregation in 1958. She celebrated 60 years as a Sister. During her nursing career, she was a staff nurse, head nurse, supervisor and ICU nurse. Sr. Jean loved working in the ICU and on the night shift. “It never occurred to me when I was baptized at the age of 17 that I could have so many adventures with the Sisters of Bon Secours,” says Sr. Jean.